To instigate long-term change, we strongly believe that planting the seeds of knowledge and awareness from an early age are the key to success. Although the missions of SloCo target conservation of sloths in the wild, it is hugely important to us that the children who live in this environment – the children who will grow up to be responsible for future conservation efforts – know as much as possible about the wildlife that surrounds them every day. This week we were delighted to host our biggest education outreach event in the city of Limon, providing a free 3-hour sloth workshop to over 50 Costa Rican school children. 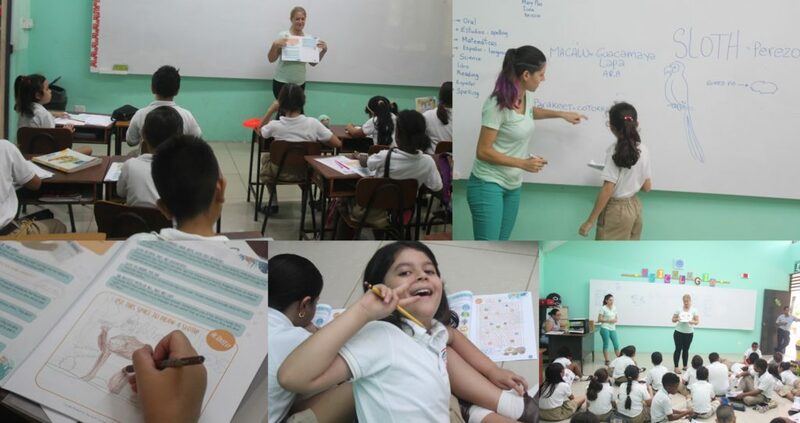 This workshop connects the children to nature and equips them with the knowledge and skills necessary to identify environmental challenges in their communities related to the conservation of sloths and the rainforest ecosystem. To do this we have designed a sloth and wildlife conservation curriculum that teaches children about the biology of sloths, the importance of the ecosystem, the challenges that sloths are facing and how they can help. This included providing each child with a 28-page activity booklet (designed by SloCo’s chief sloth illustrator Cecilia Pamich) which encourages learning through interactive games, puzzles and challenges. If you are a teacher or parent and are interested in using this booklet then it will be available for download from our website in 2019! One of the key lessons that we focus on is to teach the children how to distinguish between wild animals that belong in the rainforest, and domestic animals that can be kept in the home. Keeping wild animals as pets is unfortunately a very common yet illegal practice in Costa Rica, and we believe that the key to changing this practice is through education. By the end of our workshops all children are expected to know the differences between wild and domestic species and understand the consequence of having a wild animal as a pet. 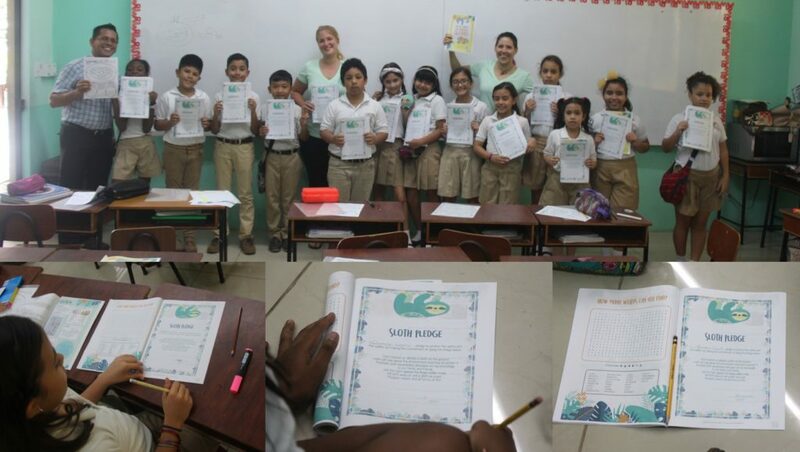 To document this, at the end of each workshop we get the children to sign a personal pledge in which they commit to protect the environment, respect nature and never keep or sell a sloth as a pet! Next week, each student is going to have the opportunity to bring what they have learnt to life by visiting a nearby wildlife rehabilitation center (the Jaguar Rescue Center). Here they will be able to witness first-hand which animals are in trouble, learn why they ended up in rescue center and see the ways that people are trying to help return them to the wild. Meeting these animals builds an emotional connection in the children and gives them a reason to get involved in helping to protect wildlife in the future. We are aiming to further expand our education program in 2019 to include programs for older children and to target schools in other regions! If you would like to help us fund more of these programs, please consider making a donation!